Yogyakarta is the only province in Indonesia still formally governed by a precolonial Sultanate, the Sultanate of Ngayogyakarta Hadiningrat. It's a center of classical Javanese fine arts and culture (batik, ballet, drama, music, poetry and puppet shows). 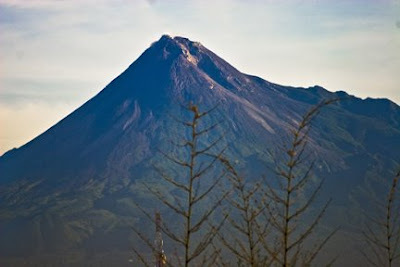 This is a view of Mount Merapi outside our hotel window. It's been active for 10000 years and today is the most active as well as produces more pyroclastic flows than any volcano in the world. 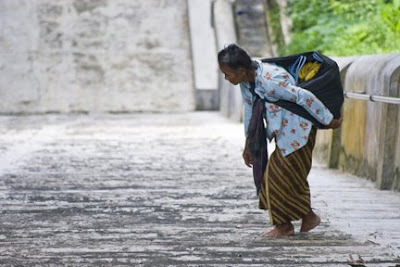 We started climbing the 345 steps to the Royal Tombs of Imogiri at the same time as this lady, and by the time we were done and ready to come back down she was just barely getting to the top with her load of 2 banana bunches and 6 bottles of water to sell. We bought all she had, exchanged sentences neither party could understand, and then she turned around and walked back down the stairs to fetch more fruits and water for selling. 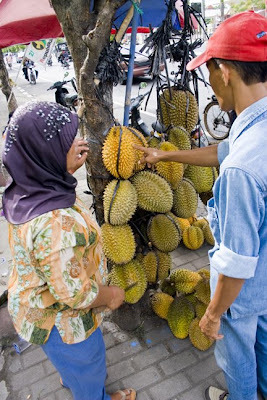 Durian Montong and Durian Petruk from Purworejo (in Sulawesi), apparently much better than the durians from Sumatra when locals weighed in. It's a denser texture and is more bitter than the Kampot, Cambodia, durian. Around the Kraton (Sultan's Palace) are densely-populated neighborhoods. 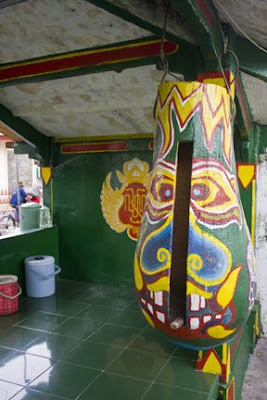 At various intervals on the streets are these huge hollow 'bells'. When there's a fire or danger, the nearest bell is rung, and those hearing it down the street will ring theirs, and on and on. They're painted in bright colors, much like the whimsical painted fish in Philadelphia and cows in Chicago for public arts. 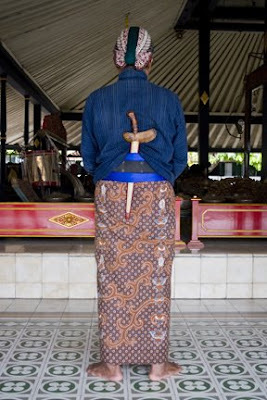 A musician from Kraton (Sultan's Palace) with a Kris in his belt. Apparently this dagger (which is not symmetrical) is indigenous to Indonesia, Malaysia, southern Philippines. It's both a weapon and a spiritual object, with each bearing either good or evil essence.